I love listening to Abraham Hicks sessions, especially when someone from the ‘hot seat’ brings a question that I can relate to. Like a lot of people, I listening the most to topics about Love and Financial Abundance. The Law of Attraction (LOA) = the circumstances and situations that you are most often aligned and Vibing with, manifest into your field (life experience). Sometimes, if not a whole bunch of times, we stay in the vibe of what we don’t ‘want’. Focusing on the things we don’t have and staying often with our thoughts and feelings on that level - what we don’t yet have. Sure, it might not be here in the physical yet....but it’s getting Ready to. And we want to be absolutely emotionally, mentally, and spiritually Vibing for All of the Awesomeness that belongs in our lives. 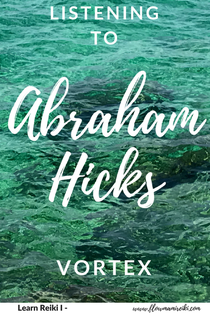 Have you heard of Abraham Hicks? What or who do you listen to or read from, that helps bring you back on track? To be honest, I especially appreciate the guys who are asking questions...because it reminds me that there are men out there who Are also working on their alignment. I definitely appreciate that!